The main raw material for the preparation of wool top is greasy wool, which is primarily imported from Australia. Greasy wool from different farms is mixed together to obtain a homogenous lot/batch for further processing. The lot/batch is then processed through scouring to remove natural grease, suint and dirt to make scoured wool. Scoured wool is then processed through carding machine to make the fibers parallel and to obtain carded sliver. Carded sliver is then processed through three gilling machine consecutively to further homogenize carded sliver. The homogenized carded sliver is then processed through combing process to remove VM, unwanted short fibers and dirt, such as, noils to make cleaned wool sliver. Combed wool sliver is further homogenized by mixing and drafting in gilling machines to obtain ecru wool top. The ecru top is subjected to dyeing process as per specific requirements and further processed through gilling and combing process to obtained homogeneous dyed re-combed tops. The grey tops/dyed tops (100% wool, 100% acrylic, acrylic/wool, polyester/wool, wool/viscose, wool/nylon or any other blends) is the basic raw material, which is processed on four gill boxes to make the fibers parallel, to even out the sliver weight by means of doublings and drafting, to mix the shades/blends homogenously and to reduce the sliver weight per unit length at different stages according to the count of the yarn to be spun. In case the yarn is required in single yarn form then the yarn is processed in yarn conditioning plant or volufil machine. 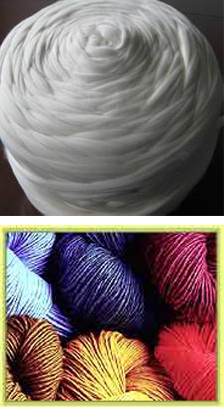 In case of 100% wool, polyester/wool, wool/nylon, wool viscose or any other blends which do not have shrinkable fibers are steamed in yarn conditioning plant to set twist in the yarn so that the yarn do not give any snarling problem due to the twist on further process and the yarn like 100% acrylic, acrylic/wool or any other blends having shrinkable fibers are processed on volufil machine (cone to cone yarn bulking machine) to make the yarn bulky and soft for hosiery , knitting or weaving as per the specific requirement. We specialize in 100% acrylic Anti pilling and Low Pill Super Soft Yarns , Acrylic wool blends, Acrylic nylon blends ( Cashmere Like and Angora Like Yarns ) . All yarns for sweaters are being used by renowned brands . Single Yarns for socks are also available. We are also making Stretch yarns with PBT , Acrylic PBT ( with Anti Pilling Acrylic ). These yarns can be chosen from our shade cards and can be customer ordered . The number of mixings required for high quality Acrowool and mélange yarns are among the highest in the industry. Our Latest auto-coners ensure best results for yarn faults (Thick and Thin places) and U %. All Yarns are 100% Spliced ( No Knots ) Stock Service is available in Machine Knitting Yarns. The superiority of our technology stands guarantee in meeting the challenging requirements for weaving yarns. Imperfections are well - controlled with desired level of elongation and Strength. Low Pill and Anti Pill weavings yarns are being supplied to various part of the world including India. There is a range of Fancy Yarn collection unique to our collection suitable for weaving , shawls , scarves , bed covers and furnishing etc . The basic raw material lamb wool is fed into blow room for mixing and blending with nylon, viscose, acrylic, cotton, angora etc as per requirements. The blend is then conveyed to carding bins where it is converted into sliver. The sliver is then converted into yarn on ring frame machine by drafting and twisting process. The yarn is then further processed on autoconer to obtain finished uniform yarn on cones. Fancy yarns are those produced with some deliberate discontinuity introduced either into the colour or form of the article with the intention of producing an enhanced aesthetic impression. Most fancy yarns are produced by specialist spinners using machines modified or specially developed for the purpose; others are produced from 'fancy slivers' used as minor components of yarns made by spinners with normal equipment; still others are made exclusively by filament yarns, using adaptations of the airjet texturising process.